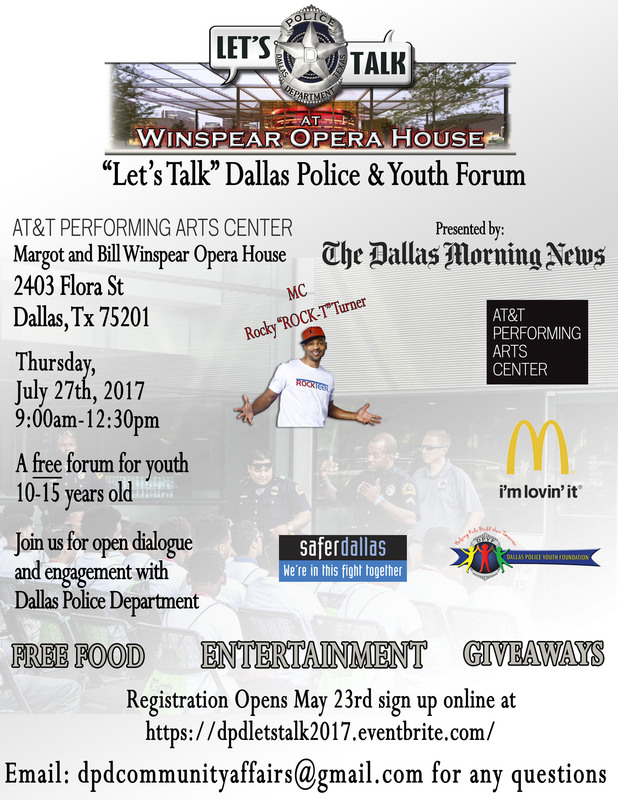 The Dallas Police Department is hosting the 3rd Annual “Let’s Talk” Dallas Police & Youth Forum on Thursday, July 27, 2017 from 9 a.m. to 12:30 p.m. “Let’s Talk” is being held at the AT&T Performing Arts Center located at 2403 Flora Street. This is a free event for youth ages 10-15 years old that seeks to foster open dialogue and positive interactions with Dallas Police Officers. We’re inviting 40+ vendors to provide free information to those in attendance. Some of our vendors include the Dallas Public Library, Dallas Animal Services, Habitat for Humanity, UNT-Dallas, the Dallas Fire Department and many of our DPD Units. Parents and chaperones are welcome to attend. Parking is free.